When summer comes I remember those childhood days that I would hurriedly collect coins from my parents cabinet to buy my favorite thirst quenching summer snack: Ice-candy. Whatever is the flavor, there will always be a magic in store in everybite of it. A truly refreshing means to beat the heat of the summer! We did had a refrigerator at home so most of the time we are just buying it from the neighbor. So when the day comes, my uncle sold us their old refrigerator, it was ice-candy everyday. Making this is fun and easy. You can make your kids help you in preparing this. You can use your fruit drinks or be creative in using other flavors. The following recipes calls for simple fruit drink based ice-candies to more elaborate flavors. And you, what is the flavor of your favorite ice-candy? For simple flavors after preparing your juices with the help of a funnel pour them on your ice-candy bags. Fill them half-way and close them by making a knot. Freeze for 24 hours. For halo-halo flavors, mix everything in a big bowl. Taste the sweetness to determine if you want to add more or less sugar. Pour them with the help of your funnel on your ice-candy bags. Freeze them for at least 24 hours. Choose well ripe mangoes for this recipe. Scoop them and make a purée using your blender. Then dissolve your cassava flour and water and pour this on your mango purée. Add one can of condensed milk. Continue blending until well mix. Laddle this mango mixture in your ice-candy plastic bags and freeze. i am searching for an ice candy that has a texture like ice cream , and i came across you site. thanks for the added flavors. i’ll experiement on that… Keep on.God Bless! How to do an ice candy that tastes like ice cream? 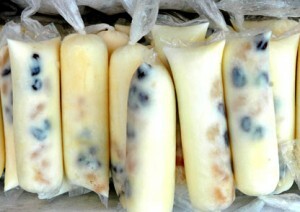 in bahrain is summer an i miss da ice candy evry were in our country,sa pilipinas. I just would like to ask how to make my ice candy taste like an ice cream or creamy, any secret recipe you can share with me. Thanks. how to do an ice candy like fruit salad and cookies and cream? how to make an ice candy creamy? which should not too costly..
pano gumawa ng ice candy n pino ice. You put “yabu” on it. It’s a starchy white powder mixed in a boiling water. This boiled water with yabu is then cooled until you can put your desired ingredients. This will make your candy creamy like an iced cream. where can i get the bags to make these…. for ice cream effect, add milk and cream or coconut cream (gata), best flavors are fruits like avocado or mango, also love corn, monggo, and chocolates…enjoy! ? how can i make an ice candy taste like ice cream? San nakakabili ng yabo powder? where can i buy “yabo” in manila? when po ba ilalagay ang coconut cream to make the ice candy taste like ice cream? lulutuin pa po ba ang coconut milk? thanks po! Add cassava flour “yabo” to make your ice candy smooth and creamy like an ice cream..
can someone please give me your cremiest ice candy ever???????? exactly to buy the yabo? Does anyone have the measurements of ingredients to make ice candy? I’m going to try and make flavors like avocado or cantalope. me paggumawa ng ice candy, nagiging prang ice cream style cya pagnilagyan ng casava flour, then milk, sugar and flavor.cguraduhin lng na haluin ng husto ang flour sa malamig ng water before ilagay sa pinakuluang water. dpat maluto ang flour. pwd rin lagyan ng food color depende sa flavor. what is yabu? is it corn starch or cassava starch… where to buy it? Anyone, pls. tell me what is Yabo or Yabu , where I can buy them ? Pls. let me know. My kids loves Ice candy, I want to make some for them. @Rowie I’ve seen some yabu or cassava cornstarch on supermarkets like Cash and Carry. If not, you can probably find them on some vegetarian stores because I think vegetarians use them for cooking filipino dishes that requires the texture of pork fat. Goodluck. I WANT TO ENGAGE IN SELLING A CREAMY ICE CANDY. CAN YOU GIVE ME THE COMPLETE STEPS AND AMOUNT PER INGREDIENT. THANK YOU! engaging in any business requires a thorough understanding of the market and the demand. It is hard to give an exact amount of the ingredients for making ice candy as prices tend to vary. I suggest to make flavors based on the fruits in season, that way there are much cheaper. Try first to make experiments in your kitchen; prepare small batches of ice candy that your friends and family can taste. Use the recipe posted here as a base but you can modify it depending on your own ingredients of your choice. goodluck! Hi.. do you have any idea kung ano english word ng ‘oraro’? Sorry ha.. out of the topic but I’ve been searching for it through the internet but haven’t found one. Thank you so much sa makakatulong..
here in bicol oraro(uraro) means a big white colored WORM, mostly found on the root of the coconut tree… =) the size of it usually like a thumb. i have my own ice candy business. i can make mango taste welly. if someone has any typical taste please tell i will inform my all taste of ice candy. Does anyone looking for ice candy wrapper? I can help you. Thank You Po. @Edz…i guess … ORARO is the same as what we locally known in southern cebu ,,,ALARO..used in making flavor of the road ice cream….it is made from cassava…. Thank you for this recipe and your website! I think this site is amazing. Nung buhay pa si mommy we loved making ICE CANDY every summer season here in the Philippines, until now me and my two elder sister’s are still making ICE CANDY, our eldest sister share her recipies kung paano gawin yung ICE CANDY like ICE CREAM. Ask ko lang po. Pagkatapos mapakulo yung yabu habang nakabukas yung apoy at kumukulona ung yabu. Ihahalo na ba ung mga ingredients pati ung asukal at gatas? At ilan kutsara po yung yabu?